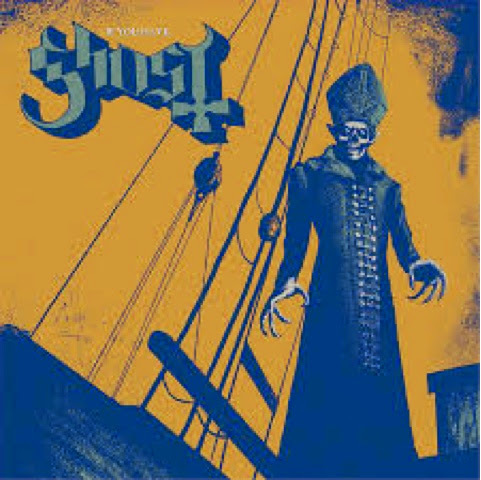 The first EP by Swedish ghouls "Ghost" is primarily a cover album. Definitely tying in with their "Infestissumam" album. Even with two of the tracks being bonus tracks from the aforementioned album. It opens up with the Roky Erickson cover (title track) which delivers a haunting feel similar to their first album while creating a sense of chaos and danger. Following that is a cover of Abba's "I'm A Marrionette" which has a good melody but can't maintain interest enough due to it's repetitiveness and seeming to drag on. The third track "Crucified" (originally by Army Of Lovers) is the standout moment here. This song fits right into the Ghost sound and vibe. Also adding a bit of heaviness to the current sound. Closing off the covers is a version of Depeche Mode's "Waiting For The Night." Ending the album is a live version of their previous single "Secular Haze". The song choice here blend well with the band's style of darker lyrics. However these songs feel like bonus tracks. While entertaining for its quick time length of just under 25 minutes. It's definitely needed for people who love the band but easily skipped by casual listeners.